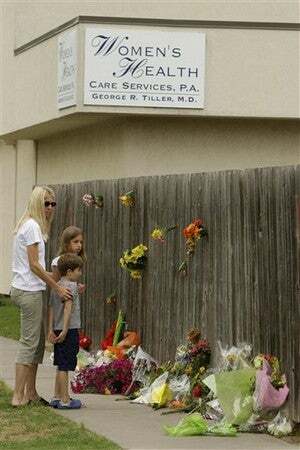 As a nation reels at the news that murdered ob/gyn Dr. George Tiller's clinic in Wichita will permanently close, the House is considering a resolution honoring Tiller. (2) commits to the American principle that tolerance must always be superior to intolerance, and that violence is never an appropriate response to a difference in beliefs. It's what the extremist wing of the antiabortion movement wanted, but this is not a victory for them. [...] I think that you will see a regrouping and a determination on the part of the medical community in this country. In the meantime, we are working to ensure that all women in this country have access to the medical care they need. Some believe that the absence of Tiller's clinic, and the circumstances of its closing, may actually hurt the anti-abortion movement. David Gittrich of Kansans for Life says, "This will change things in the pro-life movement, of course. They're not going to be able go out in front of Tiller's now." "But," he adds, "until abortion is illegal, unthinkable and unacceptable, there's going to be plenty of things for pro-lifers to do." It looks like Carhart, one of the few abortionists in the country willing to dismember or poison to death healthy babies (oops, I mean "fetuses") of healthy women during the third-trimester, is doing his part to help mitigate the recent blowback against pro-lifers with this absurd comparison. You know, Dr. Tiller had patients that were scheduled for Monday morning. What happened to those patients for the rest of the week, the rest of the month? Those patients are the ones who need us. There are only about ten late-term abortion providers in the country, some of them do not advertise, and women who need abortions very soon or have spent significant money to travel to Wichita may have trouble reaching them. For the sake of choice in America, we hope Spillar is right that others will step in to fill the void left by Tiller. But in the meantime, Scott Roeder has done violence not only to Tiller himself, but also to the women who needed him.